Two NASA spacecraft -- one that will bounce laser beams off Earth to gauge environmental changes, the other to study relics of a supernova explosion in our galactic neighborhood -- rode a Boeing Delta 2 rocket into orbit Sunday from California. The rocket fired into the late afternoon sky at 4:45 p.m. local time (7:45 p.m. EST), punching through low clouds over Vandenberg Air Force Base as it headed southward just before sunset. About an hour later, the launcher reached its destination 318 miles above the planet to deploy NASA's Ice, Cloud and land Elevation Satellite, or ICESat. 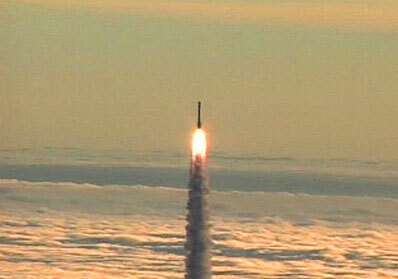 "The Delta vehicle gave us a great ride," said Jim Watzin, the ICESat project manager. "The ICESat spacecraft was right where we expected and is performing great. The whole team is thrilled to be having such a wonderful start to our mission." The launch team's celebrations of ICESat's separation were quick as engineers returned their focus to the Delta's double deployment mission, which still had critical events left to go. After the rocket's upper stage repositioned itself, the top half of the dual-payload launching structure that held ICESat during liftoff was jettisoned. That exposed the second satellite passenger packed inside, ready for deployment. Roughly 83 minutes after liftoff, NASA's Cosmic Hot Interstellar Plasma Spectrometer Satellite, or CHIPSat, was released to bring the launch to a successful conclusion. "It turns out ICE and CHIPS was a good combination for this launch," NASA Launch Manager Chuck Dovale joked after the flight. "Everyone is very pleased with the performance of the rocket, we've got the spacecraft acquired and it appears it's been a great mission." Valued at $282 million, the ICESat project will use advanced laser technology to make elevation measurements of Earth's ice sheets for environmental research. "This mission will provide revolutionary insight into changes in ice and the role ice plays in our Earth system, using a space-borne laser to look at the topography of ice both in the Antarctic and Greenland," said Ghassem Asrar, NASA's associate administrator for Earth science. "This information will help scientists determine whether the polar ice sheets are growing or shrinking, and how the ice masses may change under future climate conditions." "What is happening to the ice sheets now is a function of both today's climate and the climate over a long period of time. For the future, the main thing that's going to happen is we expect increases in melting and increases in snowfall. It's going to be a race between the two of these. We're going to get more melting at the edges, more snowfall at the center and just what the contribution will be is uncertain. It could be either plus or minus," said ICESat Project Scientist Jay Zwally. "Almost every newspaper article we read says that when the climate warms, we're going to see the melting of the polar ice sheets and the flooding of coastal areas. The truth is, we really don't know." "We need this perspective, we need this view from space, to give us the sampling (to explain) why is the ice growing in some places and shrinking in others. We don't know. We have some ideas but we need to really characterize what is going on so we can first assess the current contribution to sea level and lead to better predictions in the future," added Waleed Abdalati, NASA program executive for cryospheric sciences. ICESat will operate for at least three years, using its Geoscience Laser Altimeter System instrument to send short pulses of laser light to the ground and measuring the time it takes to return to the orbiting satellite. "Many satellite sensors measure the area of things, how big this way, how big that way. ICESat will add the third dimension, the height," Zwally said. "There has been a lot of hard work that has gone into this. It is really the realization of a dream and concept that started about 25 years ago," said Abdalati. "It is really something that hasn't been achievable until now." Sharing the rocket ride to orbit was CHIPSat. The size of a large suitcase and carrying a price tag of about $18 million, CHIPSat will study the relics of an exploding star that detonated in Earth's cosmic backyard millions of years ago. Called supernovae, such celestial events blast the gas and dust across space that is believed to be the building blocks of new stars and planets. "CHIPS is going to help us understand our own local galactic environment. We're talking about 300 light years. For an astronomer, that is very local, that is their own home town. Understanding this local galactic environment thus helps us understand the global galactic environment in the Milky Way," said Anne Kinney, NASA's director for astronomy and physics. "This small mission will further NASA's goal of understanding the structure and evolution of our universe. And we are really looking forward to CHIP's cosmic journey." Scientists say our solar system is located a region of space called the Local Bubble. The bubble is filled with extremely low-density gas, much less dense than the average interstellar medium surrounding it. It is suspected that a supernova may have created the bubble as the explosion blew most of the gas and dust from the interstellar medium outward. CHIPSat will examine the extremely diffuse gas inside the Local Bubble. "It's important to do this not only because of the fact that this is our little neighborhood of the galaxy in which we live, but also because supernovae are very widespread phenomenon in the universe," said Mark Hurwitz, CHIPS principal investigator from the University of California, Berkeley. "They take place throughout the galaxy and it may be that in fact most of the volume of the galaxy's interstellar medium is occupied by these bubbles of hot gas that are formed by supernovae." Hurwitz added, "These supernovae explosions also affect the structure of the interstellar medium. When these shock waves encounter dense regions, they can collapse those regions and actually help trigger nearby star formation. Supernovae can also expand into less dense regions and form large bubbles of hot, low density rarified gas that we call bubbles. It may be that these bubbles of hot interstellar gas actually fill most of the volume of the Milky Way galaxy." CHIPSat, the first NASA University-Class Explorer (UNEX) mission, is designed to operate for one year in its study of the remnants from the stellar explosion that have expanded across the entire sky. "If indeed supernovae took place near the Earth two to 10 million years ago, astronomers of that day would have had a very easy time studying them because they would have had an apparent brightness of approximately 30 times that of the full moon," Hurwitz said. "Today, those supernovae have expanded, become very rarified and their energy is now spread diffusely over the entire sky. So today, if you took the brightness of the full moon, spread that over the entire sky and then divided it by 10 million, that is approximately the intensity that CHIPS will be trying to detect." ICESat - Overview of NASA's Ice, Cloud and Land Elevation Satellite. 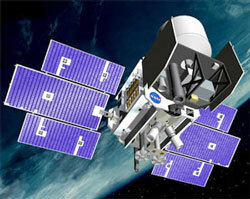 CHIPSat - Description of NASA's Cosmic Hot Interstellar Plasma Spectrometer Satellite. 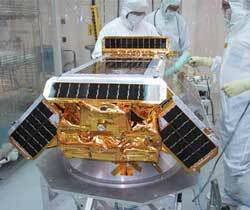 Science goals - Story on the science objectives of ICESat and CHIPSat. 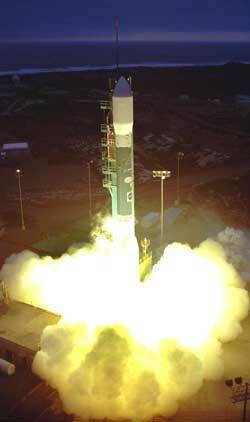 Delta 2 rocket - Overview of the Delta 2 7320-model rocket used in this launch.